Are any of you swatching for the Rav Olympics? This is my 1st pattern stitch swatch for my Team Doing A Bradbury socks. The stitch is called Yarn Over Cable (though I would call it a mock cable). 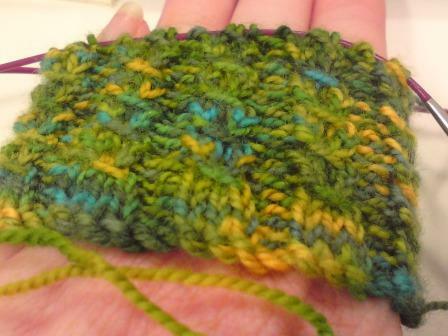 The yarn is Cherry Tree hill Supersock in Life’s A Beach, that I got from Kaylan. I was going to knit it in the Gobstopper coloured Little Lotus merino that Tham gave me. But I have since discovered that it MUST be knit into a pair of Askew socks that are up on the moast recent issue of Knitty. Sooooo cool!! Have you seen them? I want them pretty bad, but I really don’t wanna be trying new architecture out in my Olympic event.